Much in the manner of our blow-out at Arlingtons, Andy had a pre-UCS slot available. Say 3pm in Ipswich on the Monday of half-term week? Unscrew the Worzel Gummidge unshaven bonce and attach the thinking head in its place. Couple of suggestions are SMS-ed in his general direction. 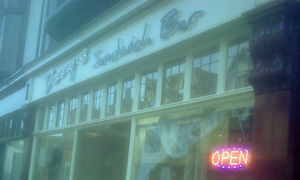 Let us sidestep over the various texts, phone calls, change of venue and a puncture and concentrate on where we ended up, a new town centre place called Danny's Sandwich Bar. Opposite main entrance to Christchurch Park, I texted, facing The Running Buck, aka The Key. Half-three-ish and I thought I'd have the place to myself. Not so. Had to squeeze into a window seat since all tables were taken. Seems like they're already a hit with the ever-increasing local student population. Given the prices displayed on the wall (and the free WiFi), that's no great surprise. Headline message is "subs, wraps and sandwiches", but I need sweet stuff. Ooh, only £1.50 for waffles with cream and golden syrup? That'll do, donkey. When Boyton Boy finally turns up wheeling his dead Brompton, it takes him all of 0.37 seconds to order identically: waffles and coffee. Mine are long since gone by that time, ditto the more than acceptable coffee. Chat with the friendly couple running the place reveals that this is something of a dream venture and that it's going well, especially Hot Dog Saturdays. Good luck to 'em and hope it works out! If it was a car -- Kia Forte. If they were passing by -- Dani Harmer.